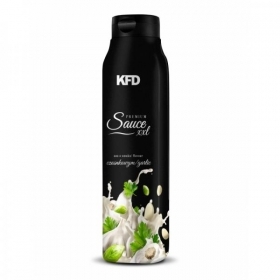 KFD Sauce Zero kebab-gyros is not an ordinary light sauce for sauerkraut with cabbage and chicken, but a product with various uses. It can be used as a spicy dip, sauce for grilled dishes, pizza, tortillas, pasta or salads. It is so delicious that you want to eat it straight from the package, and a small calorie (only 4 calories per serving) even encourages! Zero calorie sauce. KFD have created a range of sauces, that are incredibly versatile and can fit into almost any diet. KFD have been created their sauces to work with almost any diet plan, especially calorie controlled diets. This is because with no carbohydrates, sugars or fat these sauces can be worked into any meal plan without having an impact on your body's blood sugar levels. Particularly useful for those who are serious about their nutrition. Cited from:https://www.cardiffsportsnutrition.co.uk/yummy-and-fit-zero-sauce-bbqYummy & Fit have created a range of sauces, that are incredibly versatile and can fit into almost any diet. Pour over foods such as pancakes, flapjacks and porridge to add powerful flavours. Include in any protein shake to create new amazing flavours. Directions for use: Prepare a 5 ml product together as an addition to dishes. Use if necessary, eat immediately after preparation. Storage conditions: Store in a cool, dry place, away from light. After opening the accounts in the fridge and consume within 4 weeks. Before injecting. Minimum durability period: in the abovementioned. Storage conditions 12 months from the date of production. Ingredients: Water, tomato paste, rapeseed oil, spirit vinegar, modified starch, salt, agave syrup, egg yolk powder, ground chili pepper 0.5%, thickeners (guar gum, xanthan gum), preservatives (potassium sorbate, benzoate sodium), chili extract, spices, acidity regulator (citric acid), sweetener (sucralose). Contains a sweetener.